Built between 1916 and 1918, the three-story structure at 615 Douglas Street was designed as a motor-mart for automobile dealership owner Harry A. Wetmore. The Wetmore Automobile Agency sold Chalmers and Saxon automobiles as well as Waterloo Boy farm tractors. 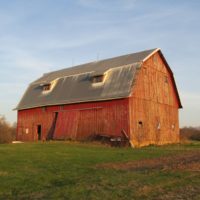 Wetmore began manufacturing his own farm tractors in the building in 1918. Wetmore tractors won a number of plowing competitions including setting a world’s record at a 1920 plowing competition held in Craig, Iowa. The Wetmore plowed five acres in two hours, 18 minutes. It also outperformed 14 other leading makes of tractors at Dakota City, Nebraska. In 1921, the Wetmore Tractor Manufacturing Company moved to a new facility on Sioux City’s west side. 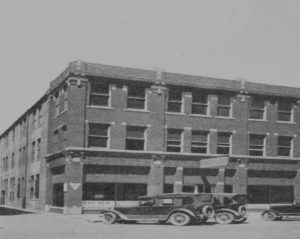 The Wetmore Automobile Agency continued to operate from the Douglas Street building through the 1920s. 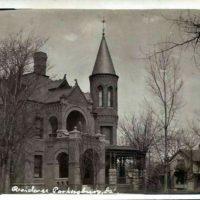 The structure has a reinforced concrete frame and an elaborate public façade made from locally-manufactured brick and stone. 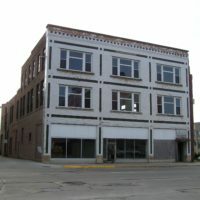 The design is typical of a number of Sioux City downtown commercial buildings of the era and reflects the influence of Louis Sullivan with elements of Chicago Commercial, Sullivanesque, and Prairie School. 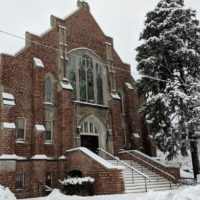 The Wetmore Building has been unoccupied since 2006 and is suffering from major water damage and deferred maintenance. The parapet cap and gutter on the southeast exposure of the building has come away from the building and water has invaded the wall. The masonry is deteriorating throughout the exterior of the building and bricks periodically fall into the adjacent alley, exposing the interior tile wall. Window glazing, roofing, and gutters are also items that are critical to the continued integrity of the building’s structure. 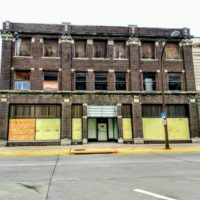 The Sioux City Inspections Department placed the building on the Red Tag/Placard List in 2017 due to numerous code and safety violations and the building may be razed if there is no resolution of the violations. 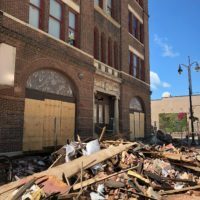 The current owner has taken no action to correct the code violations, to date, and has shown no interest in purchase offers from local developers. 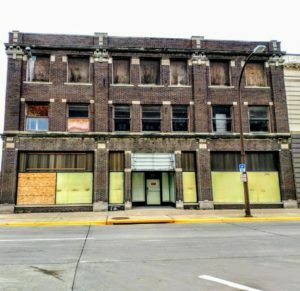 Ultimately, the Sioux City Council could move to demolish the building but has deferred this action for the present in the hopes the building can be saved and ultimately returned to use. 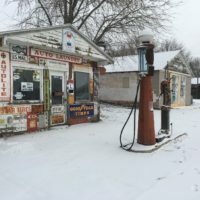 Preservation Iowa’s Most Endangered Property program was started in 1995 and implemented to educate Iowans about the special buildings and historic sites that are slowly and gradually slipping away from us. 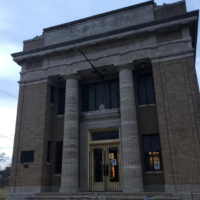 In the past 20 years, Preservation Iowa has designated over 140 archaeological sites, churches, landscapes and a variety of other buildings.